You may remember me raving on and on about my black Old Navy sneakers that I purchased last year and how comfortable they were. I still wear them – almost every day actually! They’re the perfect slip-on shoes to wear to PureBarre, since I have to slip them off to throw on those special no-slip socks for the class. The only issue with that pair is that they are quilted black leather… Not quite the look I want for summer, right? Flash forward to the Lilly Pulitzer for Target collection launch. I was running around the store grabbing stuff for my mom and myself, when I spotted this pair of lace sneakers in the shoe section. Totally unrelated to the Lilly collection, but I had to have them. This pair is so easy and comfortable – they’re the perfect summer sneakers! Slip-on sneakers are such a good alternative to sandals when you know you’re going to be walking quite a bit (like in New York!). On one of the warmer days, I paired them with my newest BB DAKOTA addition, this simple sleeveless dress. Another ideal piece for when the temps skyrocket this summer here in Dallas! love how chic and simple this outfit is! 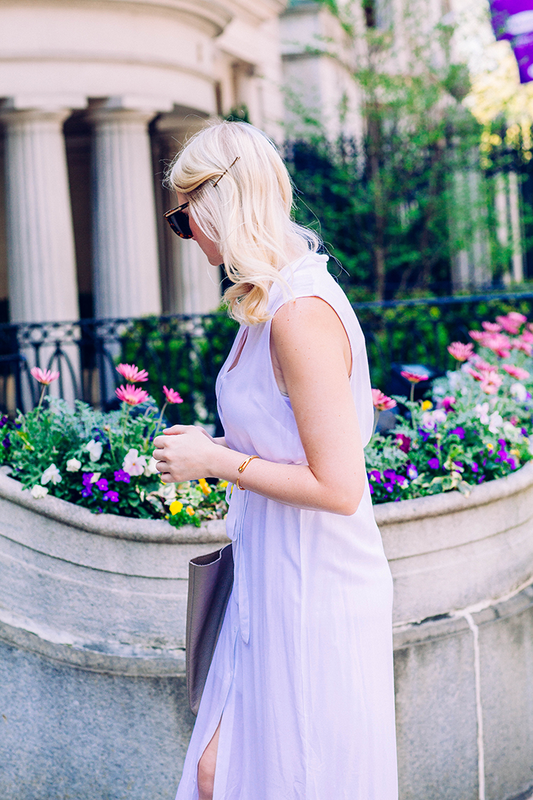 Loving all the white, perfect Summer look. Great shoes! I want a pair. Isn’t it fabulous when we find such perfect pieces that are so affordable!? Loving the all white with the taupe Cuyana! I love your outfit AND the pretty background! Such a breezy and pretty look! I need to look for those sneakers next time I’m at Target! You are too cute! Love the dress + the slip on sneakers. I love the sneakers! I just got a pair of New Balance that I am excited about, but this takes sneaker chic to a whole new level! So cute! Gotta love Target! Just bought them. I love getting your emails every day! My 2nd purchase through one of your finds in just a few weeks (and I wear the other one non stop)! Keep them coming! Can’t wait to receive them. I’m so glad to hear that!! Can’t wait to see how you like these sneakers – I probably should have mentioned that they ran a little big on me, but let me know how they work out for ya! I ordered two sizes online (to get the free shipping.) We’ll see which one wins. I love your site and posts!!! Those lace sneakers are so cute! Can’t believe they are from Target! They’re so cute! Gap also has a peach perforated pair I have my eye on! But love the lace. Gorgeous look, love the dress! i’m loving this look! your hair looks incredible. I’m swooning over those shoes! So lovely and gorgeous! I love the dress and hairstyle too! Love this look from head to toe! You look amazing in lavender!